We are growing, are you ready to join us? 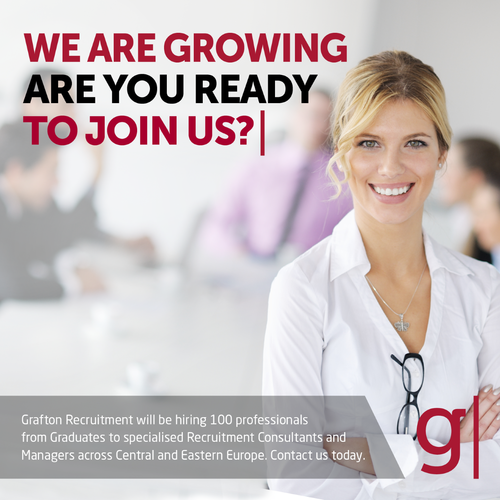 Grafton Recruitment is hiring 100 professional from Graduates to specialised Recruitment Consultants and Managers across Central and Eastern Europe. Have a look on the job descriptions below and apply now ! At Grafton Recruitment, we have four values that push our growth and create the well-known “Grafton Spirit”. Passion for what we do, Driving by Innovation, Growing our partnerships and Listening-Learning-Achieving. Work for one of the market leaders, the pioneer and most recognised International recruitment agency in Central and Eastern Europe. Grow with the best HR specialised recruiters and most of the best known companies on the market. Be rewarded with an attractive compensation + monthly commissions / bonuses. Enjoy your conditions at work – modern centrally located offices, friendly company culture and atmosphere, dynamic and experienced colleagues, team buildings, internal contests. Use foreign languages on a daily basis, work in a multinational environment and participate on international projects. We are hiring people with high potential as well as experts and specialized consultants with experience. If you are thinking about joining our team, please fill out the form or explore our job openings below.